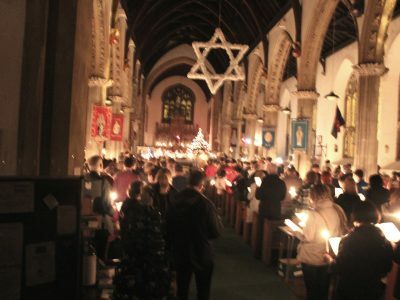 Every year we have the crib in church, beginning with the incredibly well attended Crib Service on Christmas Eve and then going through the Christmas period. It changes after 12 days (the 12 days of Christmas) as the shepherds depart and the wise men arrive. 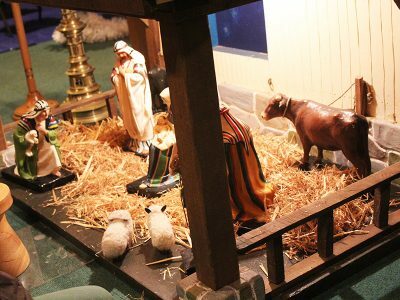 Christians believe that tiny baby in the crib represents a startling fact – God was born as a human. Jesus is not just going to grow up to be a good man, a prophet or a teacher; but from the moment he was conceived he is God in human form. However amazing this seems, God is becoming part of his creation, the great big God is becoming a tiny, defenceless baby. This means that everything Jesus did or said, in deed everything that happened to him, reveals to us the very nature of God himself. In Jesus’ day shepherds were not the respectable farmers that they are in Britain. Partly because they had to be out with their flocks 9 months of the year, sleeping on hillsides and mountains, and partly because their work meant they could not possibly fulfil their religious obligations or obey the laws of Judaism, they were outcasts in society – yet they are chosen to be the first people to see the new born Messiah. This shows us something about why Jesus was born – he brings salvation and love to the poor and outcast. Wise men came from what we now call Iraq. Studying the stars was just a part of their great devotion to acquiring wisdom and knowledge. The three gifts they bring have gained symbolic meaning – incense for worshipping God, gold for a King, myrrh to anoint him for burial. The wise men also show us something of why Jesus was born – they were the first non-Jews to see Jesus and so show us that the Messiah is born for the whole human race. No one knows the exact date of Jesus’ birth – but early on Christians decided 25th March was a proper date for the time when the Angel Gabriel told Mary she was to be mother of God’s son, so 9 months later we celebrate his birth. Conveniently this falls in mid-winter, when people have traditionally had a celebration to remember the darkest days of winter are beginning to lengthen. Jesus was born to be God amongst us, Saviour of all; definitely something worth celebrating! Jesus lived for about 33 years. Amazingly for the first 30 years of his life he lived in obscurity, mainly in Nazareth. It says something about the way God wanted to experience human life that Jesus was 30 years hidden away without anyone (apart from his mother, Mary, and Joseph) realising how unique he was. Nazareth was a small village, easily ignored by all. Its people would have had a hard and poverty filled life. Joseph was a carpenter, but we should not think of him as a master craftsman, more as an odd job man. All families would have owned a strip of land which they tried to make grow food to feed themselves; the men would have had another skill to offer to help the community and earn a few extra coins. Then when he was 30 Jesus left Nazareth behind and began a ministry of preaching, healing and proclaiming God’s Kingdom. He became famous enough to make a mark on contemporary history as recorded by such as Josephus and Tacitus. But this was not a very literate society. Most of what Jesus said and did would have been passed on orally. But four people were inspired to write down accounts of Jesus. These are the four Gospels. 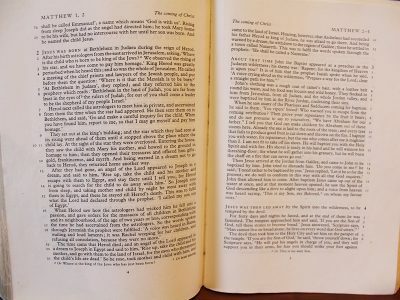 While each has a different emphasis – Matthew for example was writing for Jewish Christians, Luke for Gentile believers – they give us a vivid picture of the Saviour. A large amount of what we know about him occurs in the last week of his life – Luke for example has 24 chapters, over 5 of which record the week that begins with Jesus in Jerusalem and ends with the first Easter Day. So if we want to know about Jesus, we turn to the Gospels. But how do we know we can trust what they record? There are human reasons – people were good at remembering in an age when little was written, and we note also the large agreement between four different accounts written by fur very different people. But the main reason is that God himself inspired them, so that what we find in the Gospels is what God wishes us to know. But the Bible is a vast book. All of it is what God wishes us to know. We can read the most fascinating stories, the wisest collections of sayings, the most vivid history, the most moving and inspiring passages of prophecy and some magnificent ancient poetry. Moving onto the New Testament we can read not just the Gospels, but all about the impact Jesus made upon his first followers, and about great men and women such as Paul, Peter, Mary Magdalene and most importantly Mary, Jesus’ mother. We call the bible ‘The Word of God’ because it is God telling us about himself. Some of the bible is not easy – it is after all a collection of ancient texts and ancient texts do not read as easily as modern ones. But it is always worth the struggle to understand, for we are getting information that God himself believes will inspire us and direct us. We should treat Scripture as our friend. It is a gift from God to help us. Read it, ponder it, think about it, and pray over it. This is God’s word, very precious and very gracious in its message and in its teaching for us. It must amaze us that a man who preached love and forgiveness was opposed so violently that he was put to death. How did this happen? For Jesus was hugely popular, attracting large crowds, being cheered and even encouraged to be King. But popularity comes at a price. People become jealous, and people become suspicious. The Pharisees and priests did not like the fact that the people were listening to Jesus, not them. Even less did they like the fact that Jesus’ teaching did not seem to give them any place of honour; in fact he was often critical of them. ‘God loves you’ he would tell the crowds. The Pharisees and chief priests believed you had to earn God’s love by obeying laws and customs. The Romans meanwhile occupied the country and were very suspicious of anyone who could attract a crowd. It would not be long, they thought, before he would tell those large crowds to take up arms and rebel against Rome. The chief priests decided it would be better t get rid of him. The Romans had no interest in standing up for a Jew, and when they heard people were calling Jesus ‘King of the Jews’ they decided to execute him. Crucifixion is a terrible way to die. Romans would not crucify a fellow Roman, though execution was common enough. It was reserved for violent and rebellious subjects who agonising death, happening very publicly, would be a deterrent to anyone else who might think of following in their footsteps. But Jesus, condemned as a criminal, is not just any criminal. He is God on earth. So what is happening when God is strung up on a cross? Can there be anything more sinful or evil than to try and kill off God? To throw him away as if he were worth nothing? This surely is the greatest act of human sin. And sin is to turn away from God. God is perfect holiness, so the smallest lie, the slightest act of selfishness, moves us away from God. It is like turning our backs upon him. But God wants us close to him, wants us to love him as he loves us. So what is to be done about human sin? The answer is that it has to be defeated, robbed of its power. So if God himself faces the greatest act of sin there could be, but faces it with love, what will happen? Can we kill God off, throw him away? Jesus died because he believed that dying in love, he would save humanity from its sin. God is a God who transforms things. So the Romans looked at the cross as a method of execution, we look at the cross as a sign of God’s love, as the forgiveness of sin, as the means of a life deeper than we can imagine. 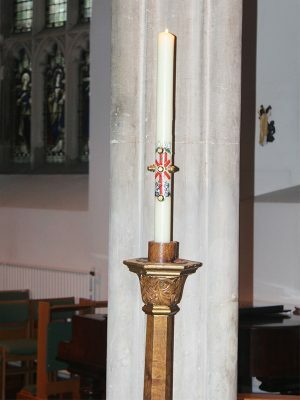 Standing in a prominent position, at the front of the church, near the font, is the Paschal Candle. It is sometimes called the Easter Candle, but ‘paschal’ is a better though more difficult word. Paschal refers not just to Easter Day but to the days and therefore the events which precede it. Paschal takes us from the Thursday evening, through Good Friday, past Holy Saturday to Easter Day itself. In that time Jesus has celebrated the Last Supper, been arrested and tried, been crucified, laid in the tomb – and then comes Easter Day. Jesus died at 3pm on the Friday. By the time permission to take away his body had been obtained, it was getting near to sundown. Not only was the light fading, but the Sabbath – when no work is allowed – was beginning. So they put Jesus rather quickly into the tomb, intending to come back to anoint his body with the various spices and perfumes. But when it was light again -–on the Saturday – it was still the Sabbath (Jewish days go from sunset to sunset.) Then when the Sabbath finished on Saturday evening it was too dark. So the first opportunity for anointing Jesus’ body was early on the Sunday, the first day of the week. Anointing the body is women’s work, so it is the women who come and discover he answer is seen on Easter day – death, sin and evil are defeated, Jesus is alive eternally. The candle is lit at the first service of Easter Day, a service which takes place when it is dark. The candle is marked with 5 nails in the shape of a cross, the five wounds of Jesus (hands, feel and his side where they thrust the spear to make sure he was dead.) Then the candle is lit and carried into the dark church. ‘Christ rising in light, casts all of the darkness out of our lives and our world.’ It is a living flame, so it represents Jesus alive among us. Without the Resurrection, there is no Christian faith. But if Jesus has risen, then new life floods the world and we are given that new life as a fee gift from God. Death, sin and evil are defeated – and we have a share in that triumph. This does not mean we will not die – of course we will – nor does it mean there is no sin or evil in the world – we see its effects each day. But it does mean that our destiny is not to die eternally, nor be separated from God by sin and evil. We are destined to live in eternal life with a God who on the cross has won a victory of love which we never could. 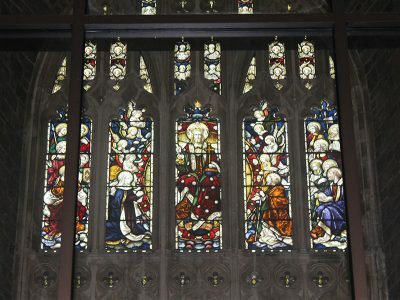 In the West window of the church there is a series of stained glass images. Because of the chamber built above the West entrance it is not easy to see the details, though when the sun shines through at the end of the day we certainly see the brilliance of the colours. 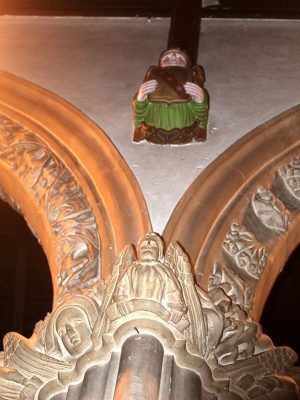 In the centre is the figure of Christ in glory. Christians still believe the risen, glorified Christ is with them. The Holy Spirit still empowers the sense of mission without which we are incomplete as a church, and grows within us the fruits of the Spirit. In the visions of heaven in the complex Book of Revelation, Jesus is seen in his glory but still bears the marks of his death. The risen and glorified Jesus is the same Jesus who loved and died and rose again. He took on human form when he was born (in fact when he was conceived in Mary’s womb) and has taken humanity back into glory. This is important for us, for it shows that just as on earth a human form could be combined with divine nature, so in glory human form can be exulted and glorified. Which means that you and I can be exulted and glorified – not because we have earned it but because Christ has earned it for us. So it is worth searching out this part of the West Window and remembering Jesus in glory. It is the glory he has promised to share with us. 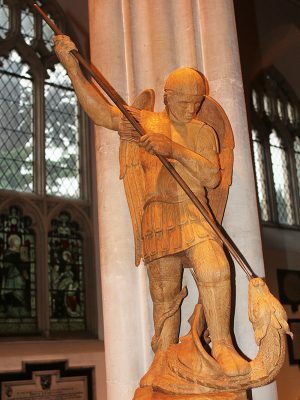 The church in Heavitree is dedicated to St Michael and All Angels. 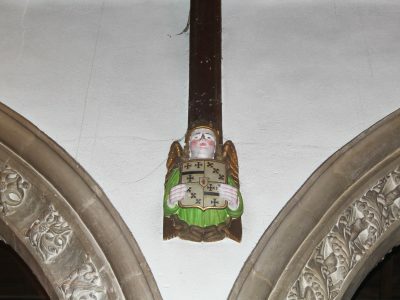 So the church is full of images of angels, including the fine carved image of St Michael, the painted angels on the ceiling and the carved angels at the top of the pillars. Michael’s name means literally ‘one who is like God.’ In Scripture Michael is shown always as combating and overcoming evil. So in any statue or representation of him, he is shown as treading down a dragon, which is the image of evil. Any Christian is called to fight against evil, to stand up for what is right and to struggle against sin and temptation in our own lives. In heaven the angels worship God. Here on earth we come to church to worship God. So in a very real way the church is where the worship of heaven and the worship of the folk here meet. So we have all the angels in church, watching over us and joining with us in worship. People often have curious ideas about angels. Angels are heavenly, spiritual being whom God has created to be with him in glory. By and large their heavenly task is worship. But Jesus also teaches us that we all have a guardian angel to watch over us. We do not know the name of our guardian angel, but can ask for his protection and guidance. The word angel literally means messenger. This is seen most clearly in the ministry of Gabriel in the beginning chapters of Luke. Gabriel bring a message first of all to Zechariah, telling him he is to be a father of a great prophet, John the Baptist. Then he appears to Mary to give her the message that she is being asked to be mother of the Messiah. Then angel of the Lord (not specified as Gabriel) tells the shepherds that Christ is born and suggests they visit him. Church is where heaven and earth meet. The angels here are showing us something very important. For the Kingdom of God is among us, and heaven and earth repeatedly touch and embrace. We experience it most obviously in worship, but this is true of life in general. Look around and maybe we can see in the events of our own lives that we touch heaven frequently. Angels are around us. Jesus always gathered crowds around him. Often it was the 12 disciples. At other times it was the huge crowd of 5,000 that he fed in the middle of nowhere. We read in the Gospels that he found it difficult to find time to be quietly with his Father in prayer because of the demands of the crowds. The chief priests found it difficult to arrest Jesus because he was always surrounded by people – only when Judas turned up to tell them when Jesus would be outside Jerusalem and free of the large crowds could they proceed to make him prisoner. Jesus still gathers people. 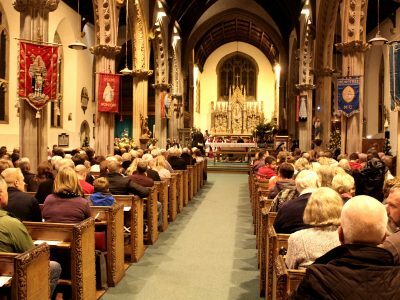 In church we gather, young and old, single and married, child and grandparent, in work and out of work, male and female; Jesus gathers us together. Sometimes it is small numbers – a couple of people at a mid week Mass. Sometimes it is large numbers – on a Sunday, at a wedding or a Baptism, at a big service such as the Crib service in our picture. Jesus brings us together because the faith is something shared not hugged to ourselves. There is a rich pattern in scripture. God works through people. It is through the Patriarchs that he makes his promises. It is through Moses and Aaron that he brings Israel out of slavery. It is through the prophets – each so very individual – that he announces his message. It is very strikingly through Mary that he brings his Son into the world. It is through timid working people such as Peter, James and John that he establishes his church in a hostile and powerful society. God works in partnership; and he still does. So we too are his people. We are part of a local congregation, but part of many millions throughout the world and millions of millions throughout history. And God asks us to partner with him to do his work on earth. To work with him to spread the Gospel, to care for the poor, to stand up for justice and peace. The Church is made up of ordinary people, not of specially holy or talented people but ordinary folk living ordinary lives who have found in Christ a Saviour to rely upon. Jesus gathers us and bids us work with him to bring his light to the world. A church may be used for many things but above all it is a place for worship and for prayer. People appreciate a place where they can be still, find a few moments of peace, light a candle and pray. There is little silence or stillness in our daily routines – no wonder people lose touch with their inner, spiritual lives. Or do they? Far more people than a generation ago would call themselves ‘spiritual’. While it is not always clear what they mean by that word, clearly there is a desire for prayer or something like it. Many people talk about the need to achieve inner peace. But Christian prayer is not about inner peace, though such peace may well be God’s gift. Prayer is about relationship, our relationship with God. He wants us to be as close to him as a child is close to a perfect Father. We cannot be close to someone we never talk to, never spend time with, and above all else never listen to. If we want to pray we must first of all be still. Of course we can fire off prayers while we do other things, but the heart of prayer is to be still and silent. We read in the Gospels how Jesus would go to deserted places to pray, and when life was at its busiest would get up early in the morning to find the time for prayer. The Lord’s Prayer is an insight into Jesus’ own way of praying. It is very simple, intimate and trusting. A good way of praying is to say the Lord’s prayer very slowly, letting each word have its full weight. Then begin it again and again, as the words allow us to come into God’s presence. The index finger is used to point. It is the finger of accusation. It is the finger that reminds us that we are sinners, needing God’s forgiveness. It encourages us to a time of penitence, seeking God’s mercy. The middle finger is the longest. Here we give thanks, remembering things we often take for granted. The fourth finger, the ring finger, is the finger of love where we wear a wedding ring or an engagement ring. Here we pray for others, beginning with those we love most but not forgetting the troubled places and people of the world. Finally the little finger is the shortest. It is the finger than we use to pray for ourselves, its smallness reminding us that prayer is not about endlessly telling God what we want. A Christian must be a person of prayer. In church and at home, regular simple prayer enriches our experience of life and sets us in the presence of a God who loves us more than we can know. There has been a church on the site of St Michael’s for over 900 years – but it has not always been the same church! The Victorians extensively rebuilt the medieval church (which itself was not the original building) and they seem to have decided to throw out the font and build another – the one which stands at the South West corner. 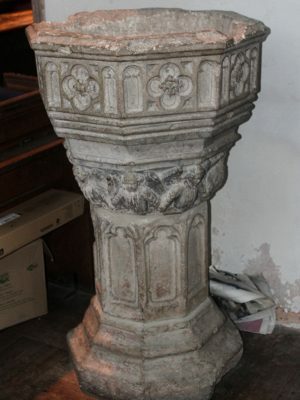 It seems the old font was literally thrown out, but was rediscovered in the land upon which Meadow Way and Kingsway was being constructed soon after the Second World War. 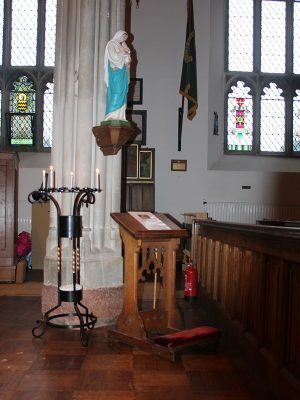 It was taken back into church and stands in the North Aisle; this is the one in the picture. We use it occasionally and it is inspiring to imagine how many hundreds of thousands must have been Baptism (or christened) in this font which has such a history. 1. The person is anointed with the sign of the cross. Anointing is a solemn way of giving the cross; we use olive oil (the oil of catechumens is its exact title) which has been blessed and sanctified in a special service by a Bishop Everything in Christianity goes back to the cross, so it is important that the first thing in baptism is to receive the cross. 3. 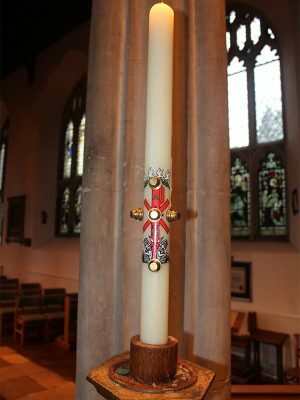 The person is given a candle lit from the Paschal Candle, to show that he or she now has a share in the life and light of Easter. In these three ways we see how God gives us all that Jesus won for us. Of course though there has to be human faith. Baptism is about believing, so the person to be baptised – or if they are too young their parents and godparents – make promises of faith. Since Baptism is meant to be the beginning of a Christian life, the promises are not meant to be a judgment on what has happened in the past but a commitment to a future with Christ. We hope Baptism will be followed in due course by the commitment of Confirmation. But we should not think Baptism is in any possible sense incomplete, needing Confirmation to make it whole. When you are Baptised you are a child of God – see Galatians 3.26-4.7. As you enter St Michael’s you will pass a small stoop filled with Holy Water. We use this as we come in and out of church to remind us of the privilege of being baptised. We dig a finger in and make the sign of the cross, the sign of being Christian. We only get baptised once. Some people think this odd, since we may be baptised as a child but then find a very real faith as a teenager or as an adult. But while we may have drifted away from God, he has not drifted away from us. If Baptism is a gift we can be sure that a faithful God has not taken away what he has given – rather he longs for us to respond with true faith. How are we to remember Jesus? In the Jewish faith ‘remember’ had a special meaning. It meant to bring into the present an event of the past. In the Mass the priest, acting on behalf of God and on behalf of the congregation, takes bread and wine and says the words of Jesus. We believe that Jesus comes to us in the bread and the wine, his body and his blood. So fully does Jesus give himself to us that we believe the bread and wine to be sacred, holding the very presence of Jesus himself because Jesus holds nothing back from us. No wonder we are urged to approach this sacrament with awe, devotion and penitence. This is the central act of Christian worship. 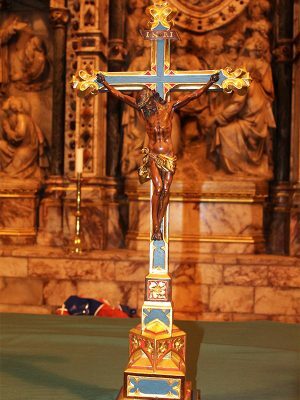 ‘Do this in remembrance of me’ said Jesus and countless millions of times bread and wine has been placed in front of a priest, the words of Jesus recited and prayed, and Christians allowed to come into communion with their Saviour. It is a supremely holy moment, but well beyond our full understanding. It is received with faith – and with great thanksgiving. 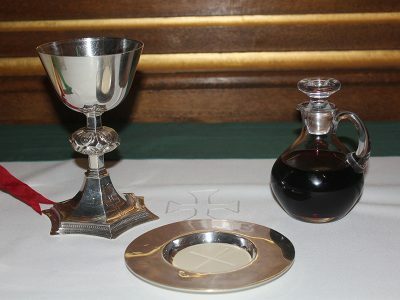 The service goes under different names – Lord’s Supper, Holy Communion, Eucharist or Mass – but it does not matter which title we use. We are obeying the command of Jesus to remember him in bread and wine. 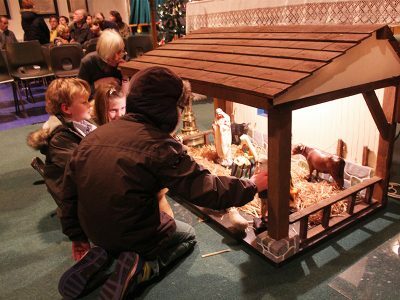 So in this parish we do this to remember Jesus each day, so that at the heart of the parish, a parish teeming with people and activity, each day Jesus is remembered and worshipped in the way he himself has commanded. We use unleavened bread (bread with no yeast) because that is what Jesus took into his own hands at the Last Supper. Similarly it is proper wine because we know Jesus would have taken proper wine. Those who receive are asked to ‘go out to live and work to God’s praise and glory’ because those who receive so great a gift are expected to be transformed by it and to express their thanks by the way they live. Usually people begin to take Communion once they are Confirmed. This is not because those who have not been confirmed are inferior or less loved by God; it is because this is so holy a gift that a time of preparation and prayer seems appropriate for those who wish to approach the altar to receive. In Luke’s great story of the Emmaus Road (chapter 24, verses 13-35) the Risen Jesus walks on the first Easter Day beside two disciples. They do not recognise Jesus (as others did not recognise the Risen Christ at first) until he takes bread, give thanks to God, breaks it and gives it to them. Then immediately they recognise Jesus ‘they knew him in the breaking of the bread, verse 35). In this way Luke shows us that we shall recognise the Risen Jesus in the Eucharist because here he comes fully and completely to us in his Body and his Blood. If Baptism marks the beginning of Christian faith, receiving Communion marks what Christians do week by week (and day by day) as we obey a great command of Jesus to do this to remember him.